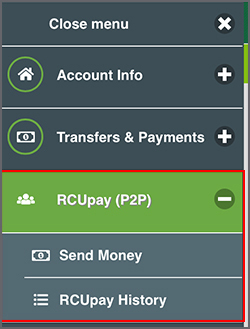 Login to the RCU Mobile app and review the details of your RCUpay transaction in the "RCUpay History". Please confirm the cell phone number or email you used to send the funds. A Pending status means that the transaction has not been claimed. 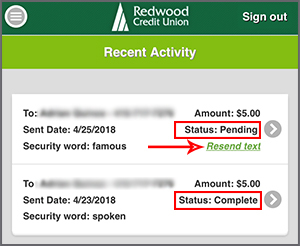 You can resend the RCUpay text by selecting "Resend text" located under the status (see example below). If you send an email the selection will be "Resend email". You will only be able to resend a text or email if the status is pending. Once the transaction is complete resend is not available.